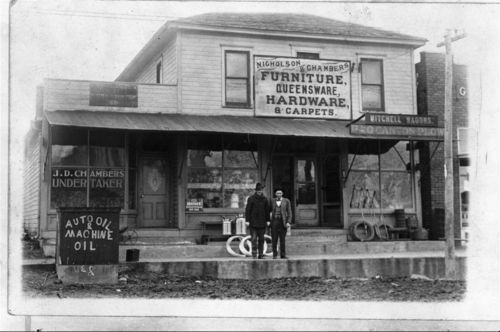 This black and whit photograph shows a view of the Nicholson & Chambers Furniture Store and J.D. Chambers Undertaker in De Soto, Kansas. The town is located in Johnson County on the south bank of the Kansas River and along the Atchison, Topeka, and Santa Fe Railroad.